This week's post is early because it's another birthday freebie and you'll probably want to download it before Friday when we usually publish our weekly posts. 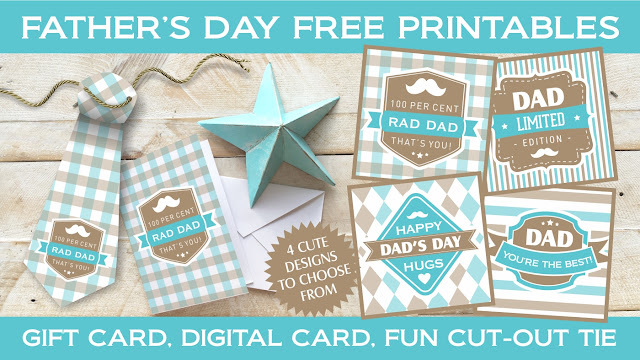 We've just put together a really cute set of Father's Day printables you'll love. Why spend a fortune on an expensive mass-produced Father's Day card when you can download one of our unique designs for free? Plus 3 of the designs can be used for future birthdays too. Bonus. A printable A5 gift card (folds to A6 and fits into a C6 envelope). A matching digital card that you can email or upload to Facebook (jpg). A fun matching cut-out tie to make for Dad to wear (easy craft project). The printables are best printed onto white cardboard. The gift card comes with cut marks and the tie comes with its own easy instructions. Just add string or ribbon. So, how do you get them? If you're on our mailing list you would have already received the link. If you aren't, all you need to do is sign up to our list. Not only will you receive the download link for free when you click on the authorisation email (remember to check your inbox for it once you've signed up), but, you'll also get our weekly newsletters which include practical tips on how to make your small business great as well as a new freebie delivered to your inbox each month. Show your dad how special he is. CLICK HERE TO JOIN OUR LIST AND GET YOUR FREE PRINTABLE. If you're a dad reading this, then you know what to do with it ... share it with your wife or kids (hint, hint) to remind them that Sunday is your special day! If you have any problems with the download, just email me directly at design@cosmic-creations.net.